Convert a LOC file to a GPX that uses the geocache symbol on waypoints. The geocaching website allows any member to download LOC files containing the coordinates for up to 20 caches. However, these LOC files do not contain symbol information, so depending on what program you use to open and download them, they may be sent to your GPS with a generic symbol. 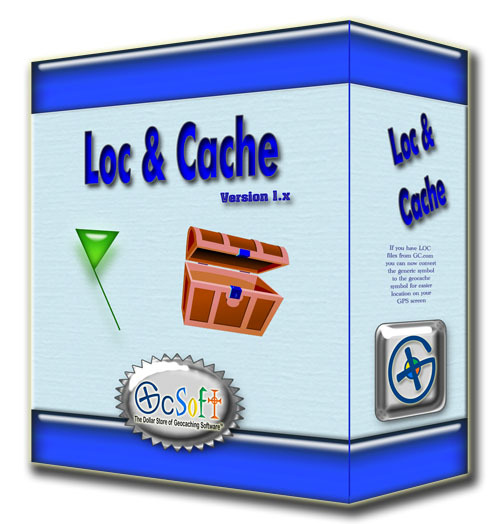 This program will convert geocache LOC files to GPX files, and specify the geocache icon as the symbol on each waypoint. You can also change the waypoint names from the default GC number to the cache name. Click on the thumbnail below to view a full sized screen shot of the registered program after a run. This program is completely free! Use registration code 96346987 to register your copy. If you're interested in using coupons for this program as geocache swag, you can find printable PDF certificates here.